The Research Library of the Milwaukee County Historical Society has a wide variety of information about the history of the City of Milwaukee and Milwaukee County. As the official repository for Milwaukee County, the MCHS research library contains more than 10,500 cubic feet of records from various county agencies such as naturalization records, civil court records, coroner’s inquests, marriage applications, jail registers and probate records. 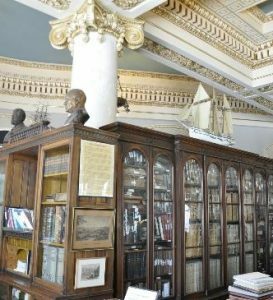 In addition, the library contains more than 3,000 separate manuscript collections from various businesses, organizations and families/individuals – some of whom are among Milwaukee’s earliest settlers. The photograph collection is also housed in the research library and includes more than one million photographs. Whether you are researching your family history or have an interest in a particular part of our local history, our collections may have the information you are looking for. The key to getting the most out of your trip is to come prepared, keep good notes and ask for help. All materials are for reference use in the library only and may not be checked out.